After a long hiatus, the fourth summit of the Bay of Bengal Initiative for Multi-Sectoral Technical and Economic Cooperation (BIMSTEC) is going to be held in Kathmandu from August 30 to 31. With top agenda of poverty alleviation along with connectivity, the summit is expected to be more productive and path-breaking for streamlining its original objectives and priority areas. The sub-regional forum, established in 1997 with objectives of strengthening and improving international trade and foreign direct investment cooperation, has witnessed agonizingly slow progress toward materializing some its major targets. The lackadaisical attitude of some of its strong member countries has raised a serious doubt over the relevance of the forum in the changing world economic order. The grouping of five SAARC nations—Bangladesh, Bhutan, India, Nepal and Sri Lanka—should have worked along with two ASEAN members—Myanmar and Thailand—to establish better connectivity for international trade and foreign direct investment. India, as the largest economy in SAARC and BIMSTEC, should have been more proactive in making the forum more vibrant. But this, as we have seen, has not happened. BIMSTEC came into being through Bangkok Declaration in 1997. Nepal joined it in February 2004. BIMSTEC aims at creating an enabling environment for rapid economic development to accelerate social progress and promote collaboration on matters of common interests in the region. BIMSTEC has set 14 priority areas including poverty alleviation, enhancing trade and investment, energy, tourism, technology, transportation and communication, fisheries, agriculture, cultural cooperation, environment and disaster management, public health, people-to people contact, counter terrorism and transnational crime and climate change. Eight more sectors including agriculture, public health and poverty alleviation had been added in 2008. But there has been little progress on these areas and none of the member states seem to be benefiting. What has BIMSTEC done in reducing poverty in the region? Statistics show that its contribution in reducing poverty is almost insignificant as none of the BIMSTEC’s priority areas have contributed to GDP growth. Primary focus of the forum is to accelerate economic and technical cooperation among the countries of South Asia and South East Asia. BIMSTEC, as an inter-regional forum, should be playing a key role in bridging the two regions to exploit possible opportunities for economic development. Every time the meeting is held, new commitments are made and new priority areas are set. But there is little progress on the ground. What amounts of trade and investment have been made in the past 20 years? Member states have not been able to achieve much on tourism, technology and transportation either. BIMSTEC has virtually become non-functional despite tall commitments to expedite intra-regional trade. The forum which was created as an alternative to SAARC has become a talking club of member nations. The claim of six percent increase in intra-regional trade in the span of two decades lacks linear relations as to which component contributed to what level of growth between which BIMSTEC members. Regional politics can be blamed for failure of SAARC. Yet, despite differences between India and Pakistan, SAARC still remains relevant for regional development through SAFTA and other programs. But BIMSTEC, despite having balancing power with Thailand and India in it, has virtually failed to devise any mechanism to invent new possibilities between South Asia and South East Asia. 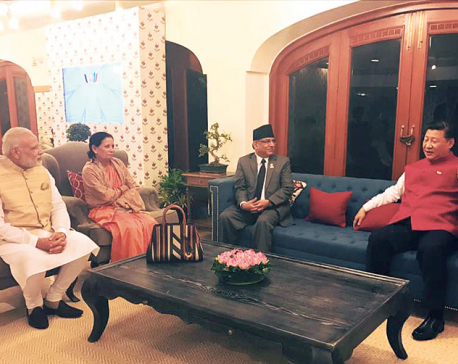 If it fails on its objectives, BIMSTEC will remain a talking club for a long time to come. There still is a room for making BIMSTEC a real inter-regional forum to address the issues of South Asia and South East Asia, the regions with vast potentials for development. The upcoming summit to be held in Kathmandu can do a lot to break the ice in transforming BIMSTEC into a vibrant forum. India and Thailand, as major economic powerhouses, can play a key role in this regard. The seven countries forum—Bangladesh, Bhutan, India, Nepal, and Sri Lanka from South Asia and Myanmar and Thailand from South East Asia—is a home to more than 1.5 billion people which constitute around 22 percent of the world population. Each member state should identify the areas of cooperation. Before the summit, the member states should review their expectations and achievements seriously. India should take the objectives and priority areas of the forum seriously. Besides, all five SAARC members should work to revive SAARC so that BIMSTEC can turn into a bridge between SAARC and ASEAN. Leaders of SAARC nations and BIMSTEC should devise a mechanism to foster healthy relations between two regional forums. This will be possible if the leaders of the region agree to chalk out ways to make BISMTEC a forum to bridge SAARC and ASEAN nations. Leaders should have that vision and commitment to materialize dream of prosperity and fight poverty together. SAARC can learn from ASEAN and they can work together to promote trade and investment in a true sense. As a host nation, Nepal should take initiatives to create environment and provide leadership to make BIMSTEC more vibrant in the days come. It should urge SAARC and BIMSTEC members to take such initiatives. Hosting the summit won’t be enough. Nepal should put an extra effort to make it more productive. BIMSTEC can be a real catalyst for inter-regional development.